Maria Paola tells me that this roll is called a michetta in her part of Italy and has been kindly sending me translations of Italian recipes after I posted asking for help on Twitter about a type of yeast called lievito di birra. I was slightly confused as to whether this was what Italians call fresh yeast or whether it was the yeast that is used to brew beer specifically. They’re all the same family but beer yeasts have different characteristics from the strain used to make bread. However this yeast is basically the same stuff we use for bread. That small linguistic puzzle out of the way, I watched this great video from Vittorio e Laura which I discovered on YouTube, a couple more times through and translated the important bits for reference while preparing the dough. Maria Paola also sent me the same formula in an email so it must be a fairly classic dough for this type of bread and that was really reassuring to know that I was on the right track. She has also sent me some wonderful techy information about getting the hole in the middle of the rolls. She has been wonderful! The main problem was always going to be the right flour type. Anyone who has been baking for a while knows that flours vary enormously depending on how old they are, what sort of wheat they have been milled from and so on. The information you get on the side of the packet gives you a basic clue in the protein per 100 grams, which in turn is an indicator of the amount of gluten in the flour, but it doesn’t give you the whole story of how the flour will behave. 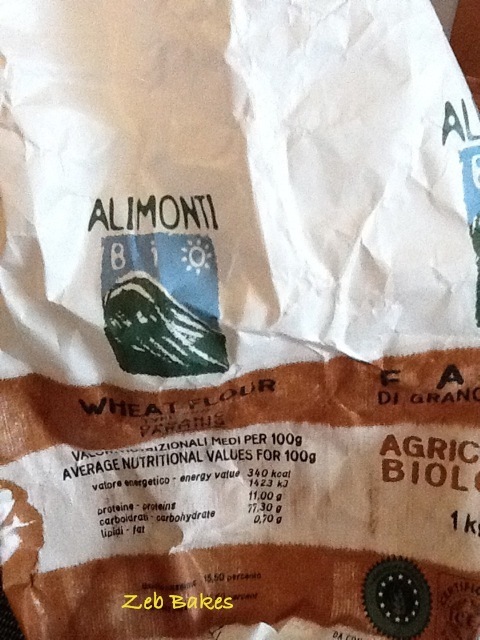 I dived into the store cupboard and found this bag of organic 00 flour with 11% protein and gave it a go. Mixing the biga was no problem, however the following day when I came to mix the dough it all felt a lot less firm than it was in the video. Now, whether that was my flour type, or something else I have no idea. I mixed the dough in the Kenwood for the time suggested and had a very loose and soft dough at the end of it. I gently worked in at least another 100 g of flour (maybe more) over the various folding and fiddling about stages and really I want to have a few more goes, maybe with different flours, and see what results I get. Dubiously I continued and here are the photos from the final stage when I have flipped the cut rolls onto the peel to go into the oven. I also only heated the oven up to 240 C or so, I couldn’t believe that it needed to be that much hotter. Next time however, I am going for the hottest oven I can manage. So, back to my tale, Brian slid the rather flat looking rolls into the oven and we poured boiling water into the tray and shut the door. To my astonishment they started to spring almost immediately and must have quadrupled in size within the space of a minute. They smelled strongly yeasty all the way through the bake and I found that offputting, but the smell vanished once they had cooled down. Once we had pulled them, singing and crackling, out of the oven and let them cool a little, I started to cut them. We had a couple for lunch and one had a hint of a hole, but that was it. This afternoon, while I was thinking about what to write for this post I picked one up, they had staled slightly but I sliced one in half and lo and behold, there was a hole! Hee hee! Altogether two out of the eight rolls had the hole. We’ll see what we can do next time! In the meantime many thanks Maria Paola for your enthusiastic support and to the lovely Vittorio e Laura too! I celebrated the holes in the rolls by stuffing them with butter and damson jam and eating them greedily stale or not, they were delicious, tasting like bread rolls used to taste when I was a kid. More beautiful Rosette Baking here from Brydie who started this quest and from Celia who found the presses in Sydney and has developed a dough using semolina rimacinata with great results. Best Aussie Baking Mates a Brit could have! Rosette (as they say in Italian) everywhere! This entry was posted in Alphabet in August, Bread and tagged biga method, Bread, Italian rolls, michetta, rosetta, X marks the spot on 26/08/2011 by Joanna. You are AMAZING! I love your tenacity and spirit of adventure within the kingdom of Breads and Buns! An apple slicer, huh? I can do that! Absolutely you can do that :D Go for it ! I am looking forward to receiving my stamp even more after reading this account of yours, I didn’t realize a special dough was used , I thought it was just any bread dough stamped out to look pretty! I have just been over to the Fresh Loaf to read all about the trials of trying to track down this special piece of equipment, what we bakers go through for our art!!! I am so lucky that I am getting mine the easy way, haha! An Italian asked me to make some of these as he could not find them here in Malaysia. I found the same video you did. Using some 00 flour I made a batch and they turned out as the video. The next batch I had to make with my own stone ground white flour. He was not happy a happy man. On the outside they looked similar, but the holes were missing on the inside. Apparently it very important. Hi Martin, lovely to hear fom you. I must admit I haven’t made these for a while. The hole is for holding the prosciutto or other fillings I am told. I am not a bread scientist but I think from the correspondence I received about this post it was a combination of a good hot bake and the finely milled oo flour that were key to encouraging the formation of the cavity. Maybe we will have to go to Milan one day and see what we can find out? Information on making natural yeast from fruit. I am trying it now.